Assassin’s Creed Odyssey will be getting a bunch of new content this month, which is a great way to start the year. There’s the next part of the Legacy of The First Blade story DLC, new mythical monsters to defeat, and new legacy lieutanants to recruit. Ubisoft have published a short video in which they explain exactly what’s coming, and showcase some of the new stuff. In the video, game director Scott Phillips and community director Vincent Le Jamtel discuss the new stuff. If you scroll down, you can watch the video yourself. If you’re in a hurry, we’ll offer you a breakdown of the most important additions. First off, there’s the second episode of the Legacy of The First Blade. It’s called Shadow Heritage, and it’s supposed to be out mid January. They didn’t want to spoil the plot, but it will continue where the first one left off, and you will get to fight a mysterious Spartan threat. There’s also something called The Tempest, which sounds kinda ominous. As for the free content, there will be two new Lost Tales of Greece. The first one, called Daughters of Lalaia, should be out any day now. In it, you’ll train a bunch of women left alone in a village how to protect themselves. The second one is called Poet’s Legacy, is supposed to come out near the end of the month, and it’ll let you join the performances of Greece’s most famous poet. The next mythical creatures is a cyclops called Arges, the Bright One. Expect a tough, level 50 boss, that drops the legendary Hammer of Hephaestus. 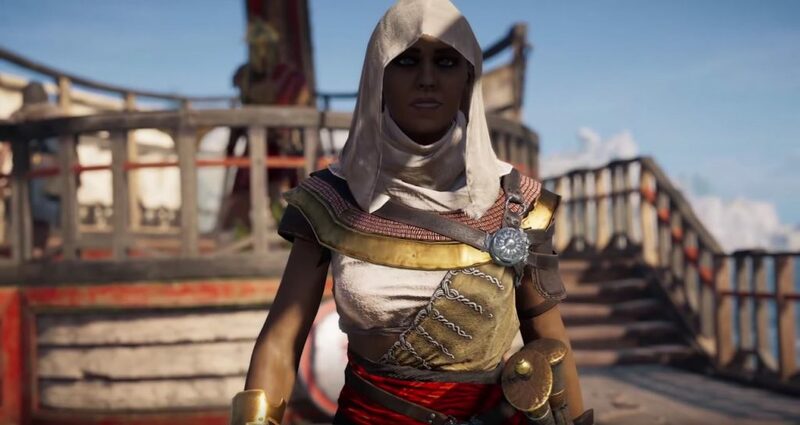 There’s also a bunch of new items coming, and they’re adding Aya from AC Origins as a lieutenant you can recruit for your ship.